At the 2015 Frankfurt Motor Show, BMW unveiled the stunning BMW M6 GT3 2016. Carrying the legacy of M6 and giving a GT3 tag with the specifications and the endurance, the model is speculated to create a new benchmark for the automotive industry. 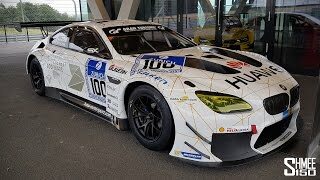 Let us have a look at the review of BMW M6 GT3 2016 to know in detail about it. The interior of BMW M6 GT3 2016 is a no nonsense work. Though the details are not yet shared but official pictures reveal a driver centric, sportive and race-spec interior with no convenience features in it. It has a multi-function race-spec steering wheel in front of driver seat with bolstering and a full roll cage. Looking at the dashboard you might get the normal feeling. The standard looks also continue to door panels but apart from these two, rest everything has been removed. Interior is also focused upon lessening the weight of the model. To attain this, company not only removed it but also added carbon fiber work in form of center stack. Thus the interior details of BMW M6 GT3 2016 are just about race and carry no fancy stuff. 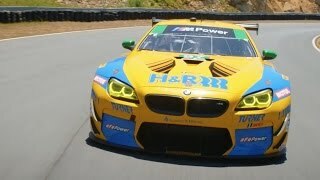 The exterior of BMW M6 GT3 2016 is an entire work of design. Starting with the front fascia it has the traditional kidney grille amidst the recognizable headlamps. Apart from these the entire package changes including the aggressively designed new lower section. The latter includes a new apron with a massive air dam while the vented hood and flared fenders are an add-on to the entire package. Moving towards the rear end, along the side you’ll again notice a new bumper and a race spec diffuser adoring the lower section while the side has M6 GT3 lettering on them, which looks gorgeous. 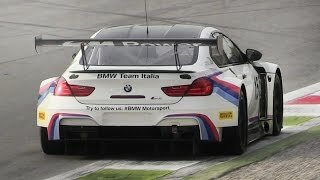 In all the exterior details of BMW M6 GT3 2016 looks truly amazing with these and the massive wing over the trunk lid.